Revisiting Warm Childhood Memories at Hollis Country Kitchen, Hollis N.H.
New England Dining Reviews>>> Hollis Country Kitchen, Hollis, N.H.
Revisiting Warm Childhood Memories at the Hollis Country Kitchen Restaurant in Hollis, N.H.
A few days ago after shopping along the tax-free southern New Hampshire modern strip mall highways and byways, we decided take a drive to the old dependable and virtually unchanged from the 1960s Hollis Country Kitchen restaurant in rural Hollis, N.H.
A personally beloved roadside restaurant that dates back to my childhood, it was nice to be back. Thankfully, the place seemed stuck in time from what I remember as one of the most down-to-earth restaurants in my whole world, known as New England. The hostess welcomed us with the biggest, most sincere smile in the world as if we were long-lost relatives. To the left, a little boy was carrying dishes back to the kitchen and setting up tables. Customers and staff interacted as if this particular lunch time was a family reunion -- conversations and laughs brightened up an already sunny place. Booths set off by partitions in an already small dining room, pictures of New Hampshire on the wall, a dessert display case up front and rooster collectibles at the counter near the open kitchen looked almost like the Country Kitchen of old. The cooks had nothing to do with the high-pressure "Hell's Kitchen" style of producing creative masterpieces, choosing to focus on delivering time-tested comfort foods in a no-pressure timely fashion to the customer while being able to joke around with the staff. Country-style chandeliers, quilted valances, an old Coca Cola logo on the drink machine in the kitchen, aged cracked menus and the sun permeating through the windows further validated the timeless presence of this classic roadside restaurant. The only new aspect -- or, perhaps, one I don't remember as a kid -- was the cozy, private outdoor dining patio with flowers in full bloom and water fountains. It was great to be back, indeed. 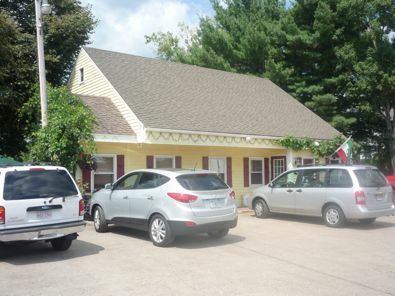 Just driving by the Country Kitchen Restaurant in Hollis, N.H., has always brought a smile to my face, and eating there one of the main joys of eternal youth. Modern times might have brought upon gourmet wraps, surprisingly high quality grilled seafood dishes (haddock is a specialty), quiche, and H&H Bagels from New York City to the Country Kitchen, but you'll also find the old standby country fare favorites like oversized pancakes and waffles, skillet breakfasts, fried chicken and seafood baskets with delicious fries and cole slaw, chicken pot pie, rotisserie chicken, burgers, grilled cheese, bread pudding and homemade fruit pies. Hollis Country kitchen has also added to its menu Italian pasta specialties and kabob dinners. On this visit, we had a delicious fresh, grilled, oversized chicken wrap with cranberries and stuffing, as well as chocolate chip pancakes -- loaded with the most important element, chocolate chips. The memories of eating at this inviting roadside restaurant a few times as a child ranked right up there with the ultimate destination of swimming at nearby Silver Lake during what we wanted to be an endless summer but turned out to be, as always, a fast-moving vacation. We also ate here during the fall season -- Hollis has always displayed nice foliage colors and places to pick apples and pumpkins at the many nearby farm stands. Granted, we didn't eat too many times at Country Kitchen back then because my folks preferred Shakey's Pizza, Green Ridge Turkey Farm and Parker's Maple Barn. All memorable restaurants, in their own right, but I knew the teen years with a driver's license and my adulthood would pave the way for more than just a few visits to the Country Kitchen. Life gets busy and long miles means more money on gas, so I didn't quite get to dine at Country Kitchen as much as anticipated, but the times dining there left equally memorable dining experiences. Under various ownership throughout the years but somehow remaining the same, that old sunny place that we knew as children has never really changed. With all the promises of change we hear about in our country, it's nice to take solace in a local restaurant that didn't follow that prescription. When we visited Country Kitchen, it was the proverbial "We picked up where we left off" scenario -- just like best friends seeing each other after a long absence of getting together. We'll just have to get back together soon, and not wait so long, this time! Editor's note: Hollis Country Kitchen is open for breakfast, lunch and dinner. We recommend calling ahead for hours before visiting this wonderful restaurant!